Whenever we refer a pathogen, most often we may think the entire microbe is responsible for the disease. But the fact is these organisms possess numerous sites called as antigenic determinant or epitopes that are recognized by antibodies or receptors on the cells in the immune system especially B cell and T cells. Any substance or molecules that interact with antibodies are called antigens. Majority of antigens are proteins but some are carbohydrates, lipids, and nucleic acids. Now let us discus the other term immunogen that is commonly used in this context. (Remember both these terms are used as synonyms). What is the difference between antigen and immunogen? Hapten is a molecule that reacts with specific antibody but is not immunogenic by itself. Haptens are low molecular weight antigens that cannot activate T cell or B cells due to its inability to bind to MHC proteins. Many drugs like penicillins are haptens. Haptens are immunogenic upon binding covalently to a carrier protein. What is the difference between a complete and incomplete antigen? A complete antigen is capable of inducing an immune response resulting in antibody production that will specifically interact with the antigen. Which are the bonds involved in Antigen antibody interaction? 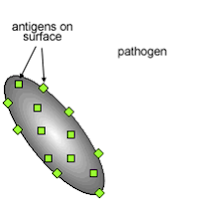 Antigen antibody specificity is widely used in laboratories to identify microorganisms. Each antigen has a specific antibody. Antigen and antibody bind by weak interactions such as hydrogen bonds and van der walls forces. The strength of the bond is directly proportional to the number of bonds formed. Continuous exposure of the same antigen increases the affinity of this interaction. What are the features that contribute to immunogenicity? 1. Foreignness: Generally, ‘self’ molecules are not immunogenic. To be immunogenic, the molecule must be recognised as non-self or foreign by immune system. 2. Molecular size: Majority of potent immunogens are large mol.wt proteins (more than 100000 dalton). Small molecules below 10,000 D are not immunogenic like haptens. But haptens become immunogenic upon binding to large mol. wt carrier proteins. 3. Chemical structure complexity or composition: Immunogens with amino acid homopolymers are less immunogenic compared to heteropolymers containing two or more different amino acids. 4. Epitopes or Antigenic determinants: Epitopes are small chemical groups (usually 5 amino acids or sugars in size) on the antigen molecule that can elicit and react with antibody. Most antigens have many determinants (multivalent). Antigenic specificity is determined by the 3 D structure. 5. Dosage, route, individual difference and timing of administration: All these features affect immunogenicity. The molecule which is immunogenic in one individual may not be always immunogenic in another individual. This depends on genetic constitution of the host (HLA genes). Adjuvants: are agents that may stimulate the immune system and enhance the response without having any specific antigenic effect by itself. Eg: Freunds complete adjuvant, Aluminium hydroxide, Magnesium hydroxide etc. In short, antigens are any foreign particle that can interact with antibodies in the immune system. But irrespective of the difference in the term antigen and immunogen, we often use the term antigen to refer immunogen and vice versa.